After we made the decision to pass Bahia Magdalena, the rest of the night went smoothly. 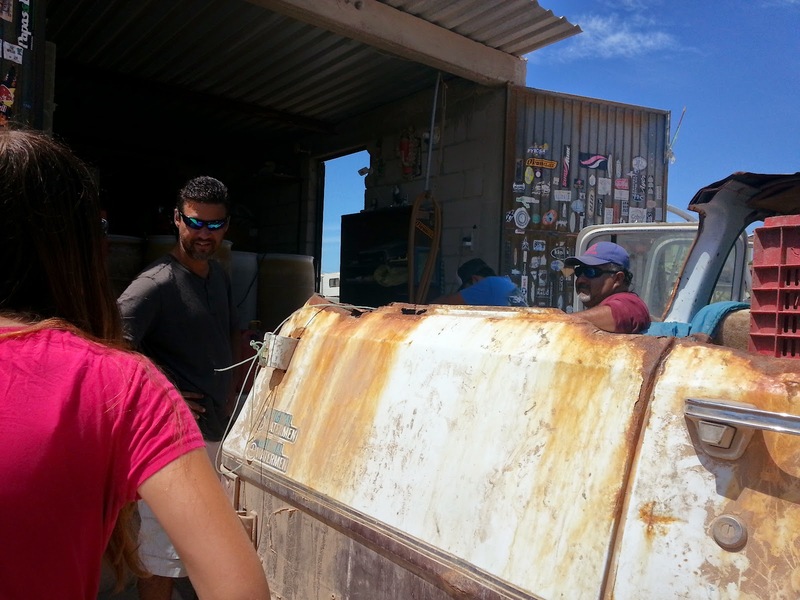 Bryan navigated us around Cabo San Lazaro, the point at the north end of the Mag Bay area, and then pointed us due north for the run up to Bahia San Juanico. There's a San Juanico Point and a San Juanico Bay. We made sure we were pointed at the right one. He even picked up an internet signal as we passed Bahia Santa Maria and pulled in a current weather forecast, which was still predicting beautiful calms through Friday evening. I woke to another clear day, no boats in sight and land only a distant outline, the glassy swell untouched by even a hint of wind. I did the dishes, taking advantage of the chance to let them dry on the stable counter before the sea changed her mood. I hardboiled some eggs, chopped the last of a head of romaine, and sliced tomatoes, avocados, and a cucumber for a chef salad. I improvised a creamy dressing, grated the last of the pepper jack cheese, and pulled out sliced almonds for some crunch. We set up the table and gathered around, grateful for one more easy day heading north. In the afternoon, Bryan hung the solar shower for me and I took a shower in the cockpit. I should have left the bag of water out to heat for a few more minutes—Brrrrrr!—but I finished quickly and the sun soon warmed my skin and dried my hair. The wind picked up juuust enough to keep a headsail full, so Bryan and Meira hauled it up and we made good time under drifter alone until the breeze died, less than an hour later. In the quiet, I read aloud to the girls from Arthur Ransome's We Didn't Mean to Go to Sea, a locationally-appropriate family favorite. Late afternoon found us curled up on the settee for a movie. The computer sat balanced on the counter between the sink and the stove and the sound cord ran across the range to the stereo so we decided to take an intermission to make popcorn. Everyone doctored it to their own liking—salt, parmesan-garlic, or cinnamon-sugar. Bryan sat on the companionway steps and stood to look around every few minutes. The girls and I would typically have taken the evening shifts, but we were within 3 or 4 hours of landfall and Bryan needed to be awake to make the call about whether to anchor after dark or wait until dawn. I'd been awake since 6:30 and my weariness had me feeling a little anxious about the prospect of a night entrance. The old rule, “Never Make Landfall at Night.” is a good rule, but not an unbreakable one. Especially if, like tonight, the moon was high, the seas calm, the visibility beautiful...and the captain willing to turn around and spend the night in the safety of the sea if needed. From the charts, San Juanico Bay seemed like an easy place to approach in the dark, with no off-lying reefs and only one, well-charted rock far closer to land than we wanted to venture. Bryan didn't need me up and anxious, at least not until the last minute, so I curled up in bed and let myself relax. Bryan stretched out on the settee and got a few minutes of sleep while Meira took her evening watch. I woke about 12:30 am in sudden silence. The girls were both in bed, the cabin and cockpit were empty, and Bryan had just shut down the engine and was stepping forward to set the anchor. He'd eased his way into the outer edge of the shallow bay and, as I watched in the light of the high half moon, he settled us snug for the night. 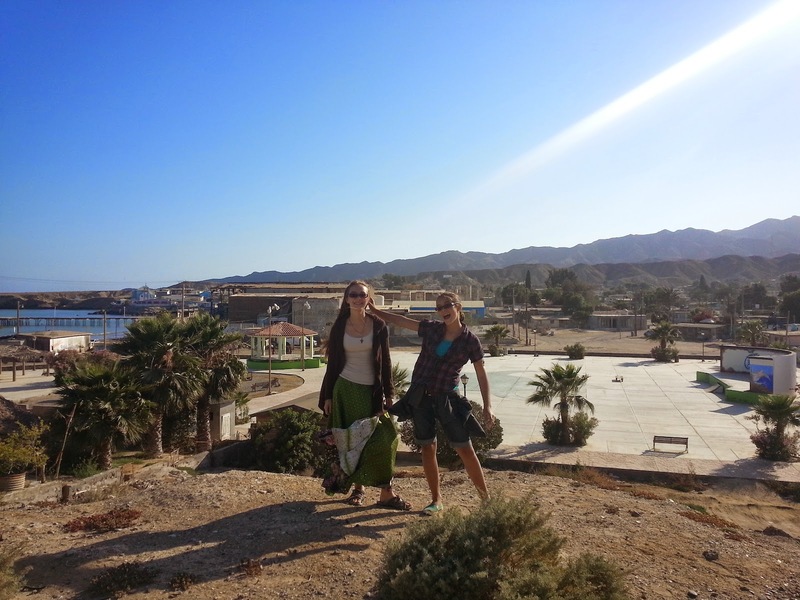 The nighttime temperatures on Baja's southwest coast are a little cooler than where we've been, but still not cold, and the daytime temperatures are perfectly warm, but not hot. I've been enjoying mornings cool enough to savor a hot cup of tea and this morning was no exception. I woke Bryan with a cup of coffee and the girls got ready to go to shore while I made breakfast burritos. We'd all eaten, and were just debating if we should tackle the long row to shore or pull up and re-anchor a little closer, when a trio of fishermen pulled up in a panga. 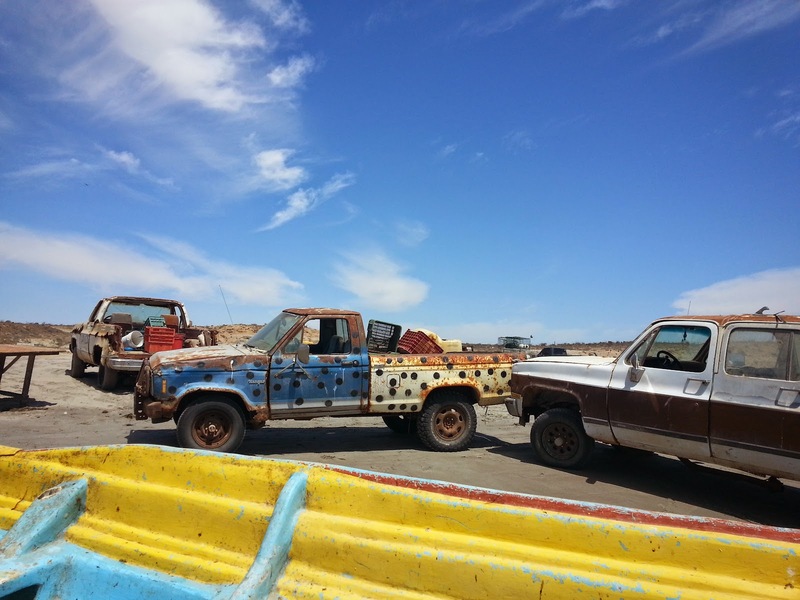 We exchanged greetings and then I asked if there was gasoline in town. One of the fishermen spoke great English and he responded affirmatively and then invited us to hop aboard for a ride. I called over, “Uno minuto, por favor!” We scrambled into our shoes and grabbed the backpack, our cash, a water bottle, and a dry bag with a couple of internet-ready devices in case we found a place to check the weather while we waited for a ride back to the boat. Bryan tossed four empty jerry jugs across the water to the waiting fisherman, who tucked them down among the lobster traps and tools. When we were all ready, the panga pulled up, we stepped quickly across, and were off. On the way in, Nacho manned the outboard and opened the introductions, pointing to his crew in turn. One of the men seemed shy and I didn't catch his name. But they proudly lifted a plank to show us the day's catch—4 white sea bass. Landing a panga at San Juanico, known for it's record long surfing waves, was a little bit tricky. 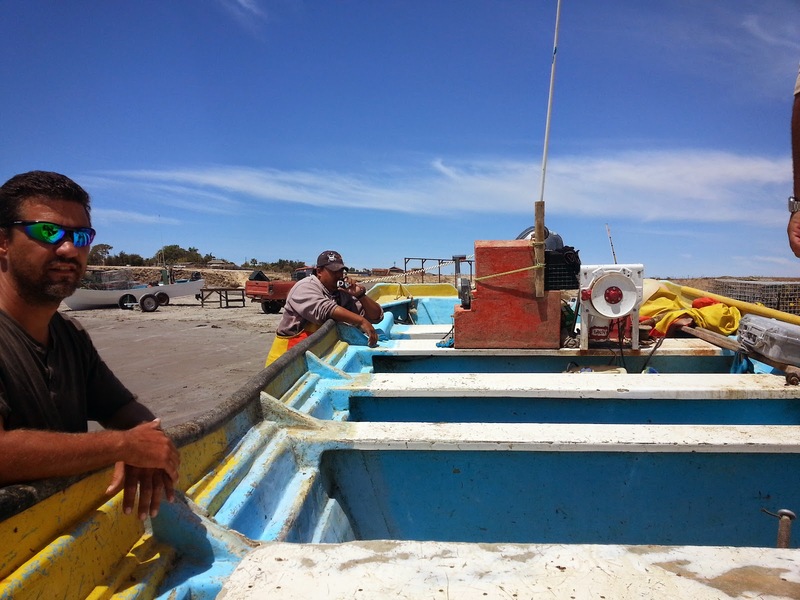 The fishermen turned the boat stern-to the beach and instructed us to sit tight until they got the truck attached. We watched, fascinated as they rolled a set of wheels down into the breaking surf and floated the boat into the makeshift cradle that connected the wheels. Luis held the boat while Nacho backed his truck down toward the water and the crew expertly tied the boat to the truck bed. The surf threw us into the sand and then floated us off again several times before the truck finally hauled us free of the sea. Once safely ashore, we hopped down from the panga. 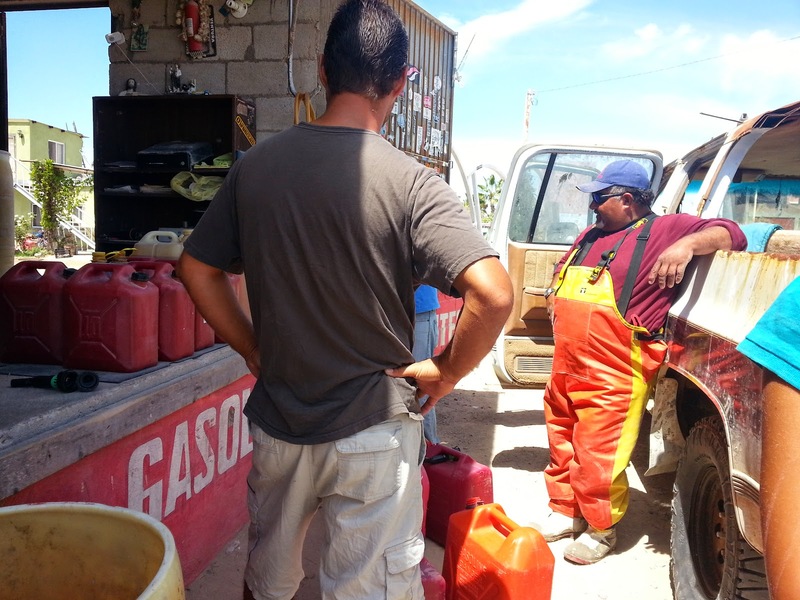 We pulled up to an open structure on the side of the road and Nacho asked one of the men there if he had any gasoline. I didn't understand the whole conversation, but it was obvious they were out. So we drove on through town to the official gas station, the gasolinera. 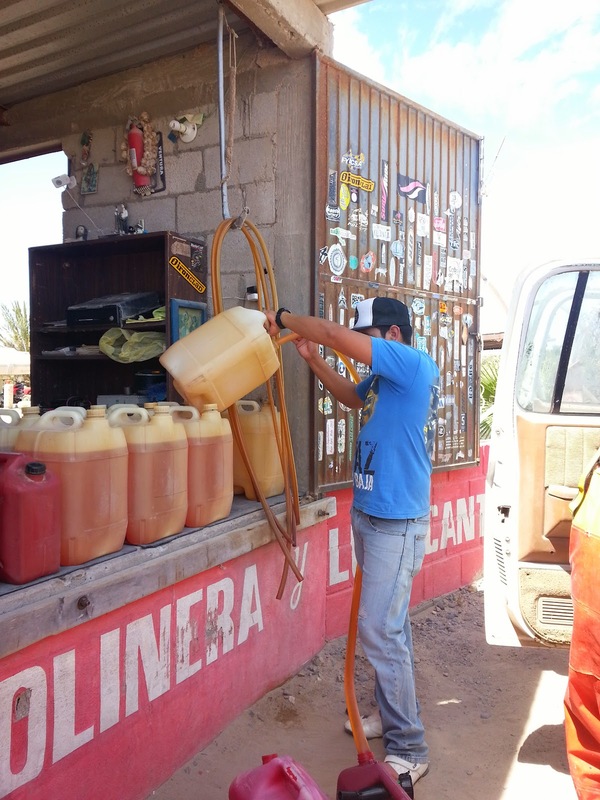 Nacho inquired about prices for us and we quickly siphoned 20 gallons into our tanks. The smell of corn tortillas from the tortilleria down the road overpowered the odor from the gasoline dripping from dangling hoses. Bryan and Nacho went into the small tienda next door for sodas for the crew and the girls and I tried not to stare at the adorable, ice-cream coated pre-school girl who came out of the store to stare at us. 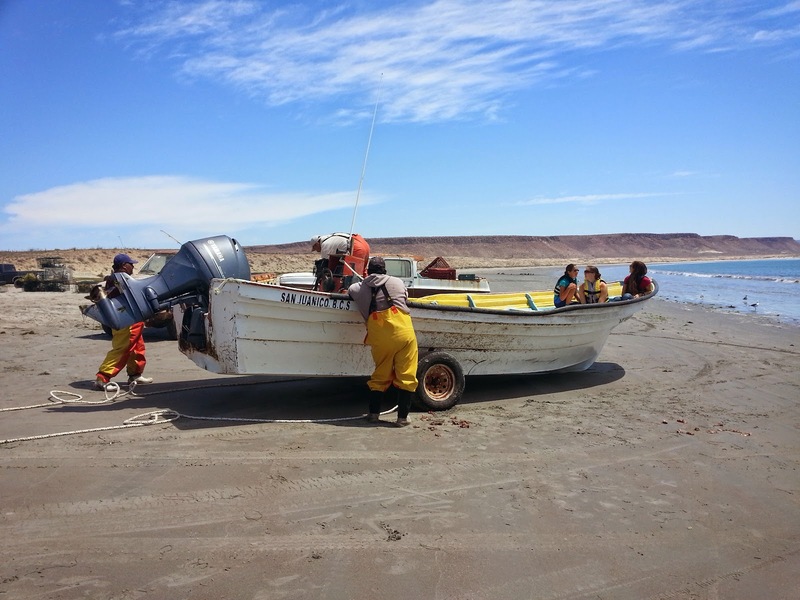 Back on the beach, the men loaded the fuel into the panga. The crew had stayed busy; fish entrails surrounded the boat and we tried to avoid tracking any on our shoes as we climbed up on the tire and over the gunwales. 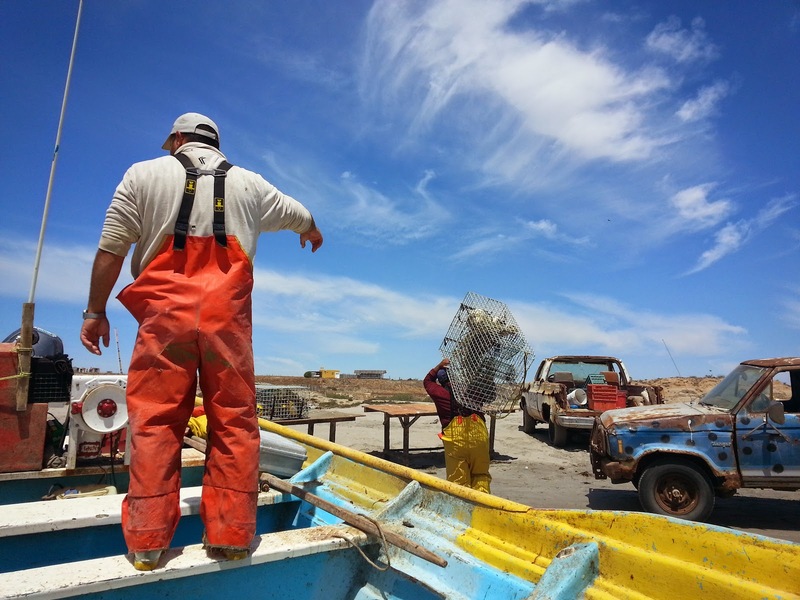 Bryan joined the fishermen in shoving us back down the gentle slope into the water. The boat bucked in the surf as they pulled the wheels back up above the high-tide line and hopped aboard. We'd anchored half a mile or more off shore, but the panga's powerful engine made quick work of the distance. I stepped back aboard and grabbed for our camera to get a couple of pictures of our good samaritans. They hadn't asked for anything, only saying they were happy they could help. But we fished out some pesos and passed them over the lifelines before they motored off. I glanced down at the clock. We'd only been gone about 30 minutes. 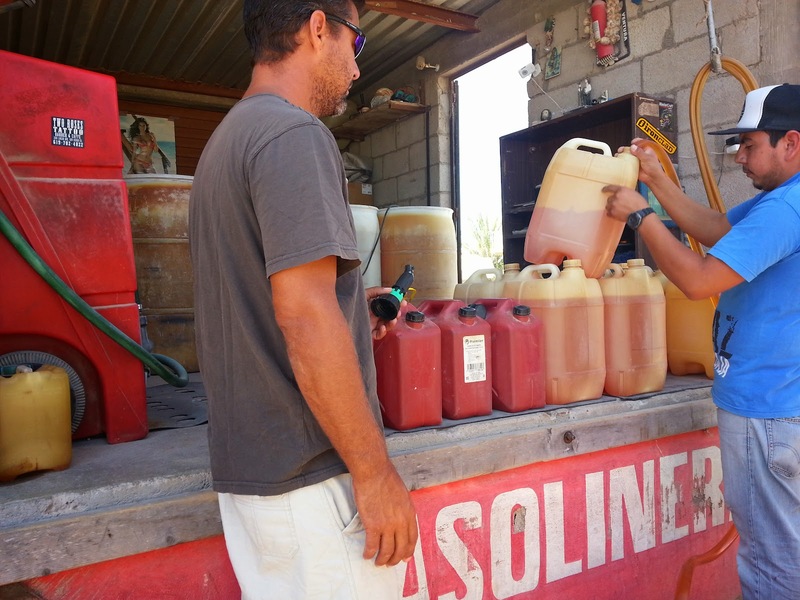 We'd hoped that skipping Bahia Magdalena would work out well, that there would be fuel in San Juanico, and that we wouldn't end up regretting our decision. But we never expected to get in, get gas, and get out so easily! 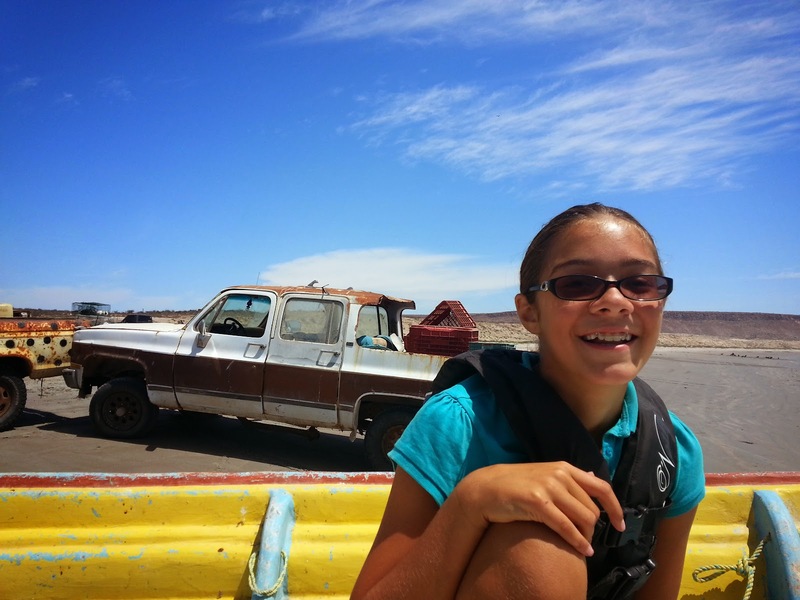 We quickly added fuel to our main tank and, just a few minutes later, Meira hauled up the anchor, started the engine, and got us on our way again. If our forecast was correct, and the weather began to shift Friday evening, we could pop in to Bahia Asuncion, where we spent Thanksgiving, to wait for a chance to day-hop north to Bahia Tortugas. But if, as our San Juanico friend indicated, the weather held all the way through Saturday, we could make it all the way into Turtle Bay by dawn on Saturday, more than halfway done with our trip up the coast of Baja in only 5 easy days. and I covered our settee cushions in the silly frog fleece we'd bought in Mazatlan. But as evening came on, reality set in. We still had at least 36 hours of motoring ahead. We sent Bryan to bed to get some rest before his night shift. Toward the end of Meira's watch, in the span of about 5 minutes, a thick fogbank blew in and surrounded us in opaque mist. I squinted into the void, listened for engine noises, and tried to stay in the present moment. The fog thickened and lightened a bit over the next few hours. I checked the barometer repeatedly and tried not to wonder if we were racing an oncoming weather system. Bird sounds flew out of the fog long seconds before the birds appeared, close on our beam. I took comfort in our remote location. No major shipping around, no large fishing vessels. And any small panga still out in these conditions would be alert and agile enough to zip out of our way. By the time Bryan got up for his watch, we'd broken free of the fog. I was glad to leave the thick, gray clouds behind. And there was evening. And there was morning. Another day. We'd been fighting a bit of a current all the way up Baja, averaging only 4 knots instead of our usual 4.5 or 5. About 6 pm, just when our Monday morning forecast had predicted, the wind picked up a bit and the sea joined in, slowing our speed to 2-3 knots. Knowing that we would likely break free of the higher current in a few hours, after a tide change or after clearing another point of land, I resisted the urge to do the math—would we have enough fuel to get all the way to Turtle Bay? As we passed the entrance to Bahia Asuncion, we edged in closer to try to pick up a cell signal and a weather report. We never managed, but we took comfort in knowing that if the wind did keep us from making northward progress, we could always turn and head into this safe harbor on an easy downwind run. I checked the barometer again. And again. And pondered the cloud formations and the wave direction. Then I let the girls take their watches, went below, and shut my worrier off for a while. Re-analyzing the conditions every now and then is helpful, but I tend to try to analyze them constantly. Again, by Bryan's night watch, the current had eased, the winds and seas had calmed down. I went to bed and gladly let him deal with the what-ifs for a while. I woke about 6:30am and squinted through the cabin to where Meira's feet stuck out across the cockpit. She'd woken early to give Bryan a little rest before our arrival and sat outside, bundled against the morning chill. I got up and helped with the navigation particulars, making sure our course was set to avoid the rocks standing sentinel across the southern portion of the entrance. Then we both sat back and enjoyed the ride. The pelicans were out en masse, performing their peculiar dives with the last-second reverse. Several dolphins arched nearby. As we passed the point and entered the bay, we pulled out the binoculars to catch first sight of the town. The bay was emptier than on our last visit; many of the pangas were gone and we only spotted one other sailboat's mast. We motored past Turtle Bay's flagship blue fishing boat and found a spot to anchor just outside the line of moored pangas. Once more, Bryan and I executed the now-familiar anchoring dance to complete leg 4. Bryan steps to the bow. I shift to the helm. Arms rhythmically releasing the rode. A figure-eight to hold the line fast. Waves one hand theatrically broad. Thumbs up for a hard reverse to set the anchor well. His whole body listening to the feel of the rope. I ease the engine into idle. He steps down into the cockpit.